(29 Oct 2018) President Philippe Germain of New Caledonia committed today to protecting 200,000 to 400,000 square kilometers (77,220 to 154,440 square miles) of marine waters within the Coral Sea Natural Park, which the government established in 2014. A management committee has been working on a conservation plan for the 1.3 million-square-kilometer park, which covers New Caledonia’s entire exclusive economic zone in the southwestern Pacific Ocean. The plan will define the park’s regions, as well as each region’s uses and level of protection. As part of the commitment unveiled at the Our Ocean Conference, New Caledonia plans to designate the area within the park as highly protected by the end of 2019, which would safeguard these waters from fishing and other extractive activities. That step would ensure that the waters remain healthy and continue to deliver ecotourism and environmental benefits. Home to an incredible array of marine life, the area committed for protection covers 30 percent of the park and includes critical ecological features, such as the subduction trench of New Hebrides, volcanic islands, an upraised coral island, and southern seamounts that serve as key underwater reference points for migratory species such as humpback whales and sea turtles. “The government of New Caledonia has shown its commitment to protecting the vibrant and diverse marine environment of the Coral Sea Natural Park. Today’s announcement by President Germain builds on the recent decision to protect 28,000 square kilometers within the park, which will help conserve some of the healthiest and most isolated coral reefs in New Caledonia’s waters. This momentum moves the government closer to fulfilling its pledge to establish robust protections and management within the marine park. “Since the designation of the Coral Sea Natural Park in 2014, we have worked with the people of New Caledonia, the government, the fishing industry, and other local organizations to increase protections within the park and to establish the management needed for these biologically rich waters. These collective efforts support a global call to action to protect 30 percent of the ocean by 2030. “The area proposed for protection is rich in marine biodiversity. The volcanic islands of Walpole, Matthew, and Hunter are refuges for migrating seabirds and home to the nesting site of the white tern. These islands are also critical breeding areas for Pacific frigates, the red-tailed tropicbird, sooty tern, and gray noddy. (14 Aug 2018) The New Caledonian government took a critical step toward protecting those places and the species that live there by passing a decree to safeguard 28,000 square kilometers of its waters within four marine protected areas (MPAs). The MPAs fall within the 1.3 million-square kilometer Coral Sea Natural Park, which was established in 2014 and covers the country’s entire exclusive economic zone (EEZ). To develop a conservation plan for the park, the government convened a management committee, which proposed the protections that the government approved today. The committee includes New Caledonian President Philippe Germain and representatives from the New Caledonia Board of Maritime Affairs, the country’s fishing industry, and nongovernmental organizations such as the Pew Bertarelli Ocean Legacy Project, Conservation International, and WWF. This decree, which takes effect later this month, will implement full protections for Astrolabe, Pétrie, Chesterfield, Bellona, and Entrecasteaux reefs and marks a tenfold increase in protected areas within the Coral Sea Natural Park. This covers over 2 percent of the country’s EEZ and its dazzling biodiversity, and represents progress towards, meeting the International Union for Conservation of Nature’s recommendation that all nations safeguard at least 30 percent of their EEZs. 20 December 2016 : The Park’s management plan is approved by the committee members, with the exception of one association. February 2017 : The management plan is presented to the population as part of a public consultation aiming to gather propositions and fine tune the document. 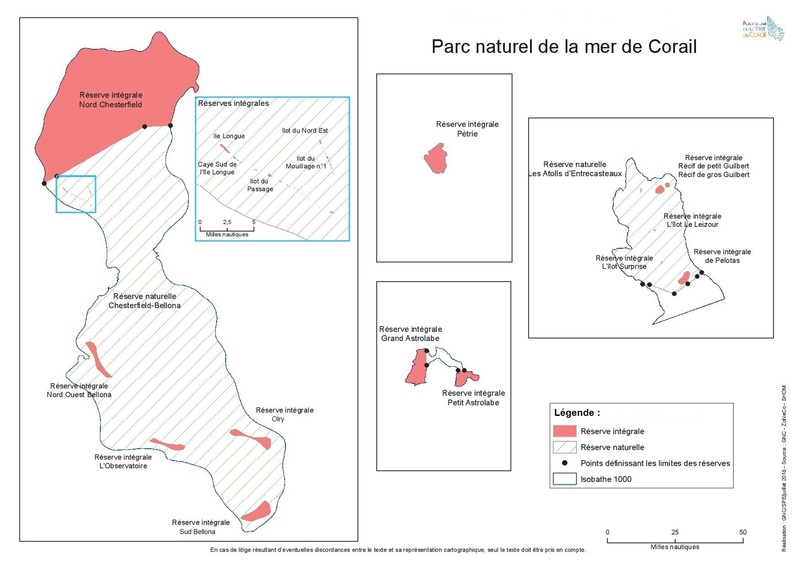 In 2017 : The management plan of the Natural Park of the Coral Sea is presented to the government, three years after its creation, as stipulated in the decree which made it a reality. March 2018 : Approval of the Decree on the management plan 2018-2022. Granting and renewal of fishing licenses under certain conditions only. Deep-sea fishing is closely monitored in New Caledonia by a network of scientific and institutional partners. After a few difficult years, the deep-sea fishing industry has taken measures to try to become profitable thanks to the joint involvement of the aforementioned network and professionals from the industry. Because the market remains narrow, professionals have been trying to find new exportation markets while diversifying local supplies. Despite its fragile balance, deep-sea fishing can be considered as an example of a sector on the road to success. Vessels authorized to fish in New Caledonia’s maritime space are subjected to satellite monitoring (VMS : Vessel Monitoring System). This system put in place in early 2005 allows the real time monitoring of vessel movements when they are in the Natural Park of the Coral Sea. Satellite complements other monitoring tools, notably fishing forms, by pointing out the gaps in statistics provided by ship-owners. Every ship-owner whose vessel holds a license and is authorized to fish must, for each campaign, provide statistics regarding its activity. These information (information on the ship, fishing effort, catches) are detailed on fishing forms whose format has been determined by the administration in charge. As far as the form format used for tuna fishing is concerned, it is developed by the Secretariat of the Pacific Community (SPC) and the Forum Fisheries Agency (FFA), and it is used by member countries. Why use a set format for this form ? So that the information provided can be used to compile statistics for the Western and Central Pacific Fisheries Commission. In June 2014 by legislative decree, New Caledonia President Harold Martin and the French territory’s political leadership legally established the Natural Park of the Coral Sea (Le Parc Naturel de la Mer de Corail). The new law brings under careful management a multi-use, marine protected area which totals a massive 1.3 million km2, making it the largest protected area in the world. Essential to people, biodiversity and climate resilience, the park’s ecosystems generate around 2,500-3,000 tons of fish each year, providing food to New Caledonia’s quarter of a million people and an economic driver for the territory’s sustainable economy. In the next phase of the park’s development, the levels of protection will be defined. Ultimately, the Natural Park of the Coral Sea will be a multiple use area with various zones for economic activity and conservation. fishing info: The Natural Park of the Coral Sea is a multiple use area with various zones for economic activity and conservation.